If, as some believe, encountering your doppelganger can spell disaster or death, heaven help the cast of Us, Jordan Peele's eagerly awaited follow-up to the Oscar-winning Get Out. In a neat twist on home invasion horror's 'stranger danger' trope, a middle-class family face off against themselves. Following a fairground-set prologue taking place in 1986, the film flips to the present day where Adelaide and Gabe Wilson (Black Panther duo Lupita Nyong'o and Winston Duke) and their two children (Shahadi Wright Joseph and Evan Alex) arrive at their holiday home near Santa Cruz for their summer vacation. When Adelaide freaks out during a day at the beach, her childhood trauma comes flooding back. That evening, a mysterious foursome appear in their driveway, setting into motion a night of unholy hell. Going heavier on the straight-up horror, Peele's understanding of genre conventions is apparent and impressive but he doesn't like to play strictly by the rules. His film unmasks its shadow-dwellers early on, which has an inevitable impact on suspense, yet he delivers beautifully shot and executed set-piece after set-piece, with enough frights to satisfy, topping things off with an interestingly conceived conspiracy. Collaborating with It Follows cinematographer Mike Gioulakis, Peele once again shows a keen eye for arresting, instantly iconic imagery, culminating in a stunning 'danse macabre' to an orchestral rendition of Luniz's 'I Got 5 on It'. The villains aren't what we expect to see and neither are their intended victims; simply by changing the race of the traditional family in peril to African American it's amazing how fresh the scenario feels. Yet the film goes far beyond invigorating tired optics. Although it doesn't quite pack the satirical sucker-punch of Get Out, the scares dress up a narrative that riffs on middle-class privilege and guilt and shines a torchlight on a hidden America, while bringing the disbelieving, tension-relieving levity you'd anticipate from a filmmaker with a background in comedy. The cast give it their wide-eyed, sometimes maniacal best (Elisabeth Moss makes the most of limited screen-time as an alcohol and vitriol-fuelled friend). 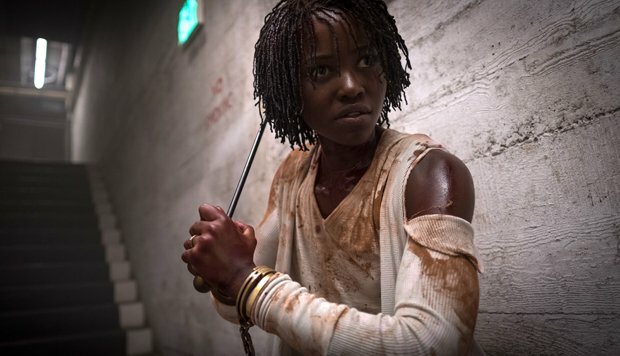 But, just as its predecessor hinged on the striking, concept-selling work of star Daniel Kaluuya, Us is held aloft by leading lady Nyong'o; she's phenomenal as both protagonist and chief aggressor – letting loose with a performance that's guttural, deranged, frenzied, heartfelt and devious. It all comes together nicely for a vividly realised nightmare that combines the classiest of production values with a whole heap of crazy. Adelaide (Nyong’o) and Gabe (Duke) arrive at their holiday home with their children, only to be confronted by a mysteriously familiar foursome. Peele’s follow up to Get Out is a neat twist on the home invasion story, with beautifully executed set pieces, and Nyong’o is phenomenal as both protagonist and chief aggressor.